Stickers, have business forgotten the power of the sticker? Stickers advertise, build brand awareness, support projects or promotions and can also make a profitable, stand-alone product.If you have a custom sized sticker, please use the custom order button to email us your requirements and we will submit a quote for your consideration. 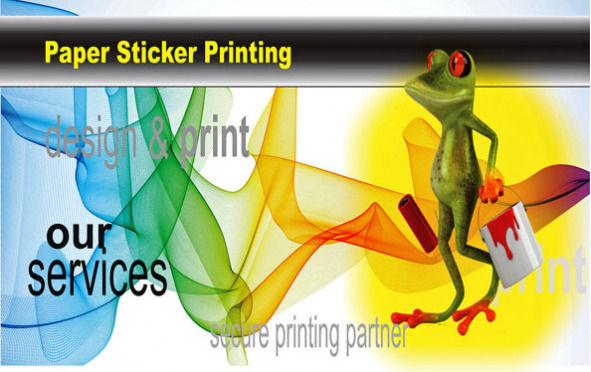 Stickers advertise, build brand awareness, support projects or promotions and can also make a profitable, stand-alone product. According to marketing experts, there are three primary reasons why consumers would want to display your custom stickers and decals. The first reason is promotional. Some customers or clients are very loyal and they want to help promote your business and share it with their friends. It is a real world version of liking something on Facebook or any other social media network. The second reason is artistic. Some people choose to display custom stickers and decals on their vehicles or other types of property, simply because they think it looks cool. It pays off to be creative and think outside the box when it comes to designing stickers that will appeal to your target audience. The third reason is personal. Some stickers – even when they are used to promote a business or service – can still be a personal expression for the people who use them. Shared political beliefs, a statement of faith or even an expression of disgust or anger at some societal issue can help to make a sticker more personal to the consumer. Follow standard artwork requirements but be careful not to create designs too close to the edge as there may be a slight movement during trimming of between 1 – 2mm. When it comes to printed marketing materials for your business, it is highly likely that you regularly invest in business cards, flyers and possibly even leaflets. However, most businesses are not actively using stickers to market their businesses and personally, I think they are missing a trick. Although stickers might seem like a bit of a gimmick, the truth is that they can offer a fantastic way for you to market your business and also, raise a huge amount of brand awareness. Most companies do not invest in stickers as they simply don't see any use for them, but in reality, there are a huge number of different uses for stickers that are likely to generate a good ROI for you (and your business). One of the best and most simple uses for stickers that are often overlooked is that they can easily be used to build brand awareness. Let's say that you give a sticker to every customer you have; the chances are that they'll soon start appearing all over the place which will, in turn, get your brand's message/logo seen by an even bigger audience. If you make sure your stickers are cool and that people would want to stick them to their personal items, you'll save much money in building your brand. Apple is one company that previously utilised stickers for this purpose. Up until a few years ago, every Apple product would include a few Apple stickers inside the box. These stickers used to end up in all kinds of places; on laptops, on suitcases, on people's desks, everywhere. Clearly, this helped spread the word about Apple and people loved them because they were cool stickers. This is something that just about any business can do with a bit of creativity. What's more, stickers are extremely cheap to purchase and therefore, often lead to a huge return-on-investment for most businesses. So, next time you are thinking about buying flyers, leaflets or even business cards for your business, ask yourself; "Is there a better option? Could I be doing this in a more creative way using stickers?"